Cook down the onions and garlic with a dash of olive oil until the mixture is clear and soft. 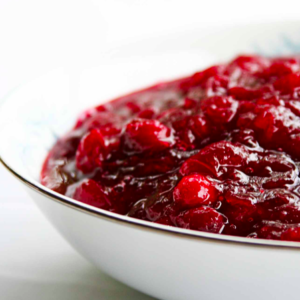 Add the fresh cranberries and spices and stir for a few minutes to sauté all together. Then add the water, orange juice, sugar and orange zest. Bring to a rolling boil for three minutes and then turn down to a low simmer, lid off. Stir occasionally for an hour until the liquid evaporates and the sauce begins to thicken. You can smash the whole berries as you stir to your desired thickness. Yummy!